Don't miss this great exhibit at Historic Spanish Point's Guptill Gallery featuring John Hamilton Gillespie! Learn more about the fascinating people and historical events from Sarasota's colorful past. Written by historian and author Jeff LaHurd and produced by Historic Spanish Point and Gulf Coast Heritage Association, Inc. in cooperation with Sarasota History Center. 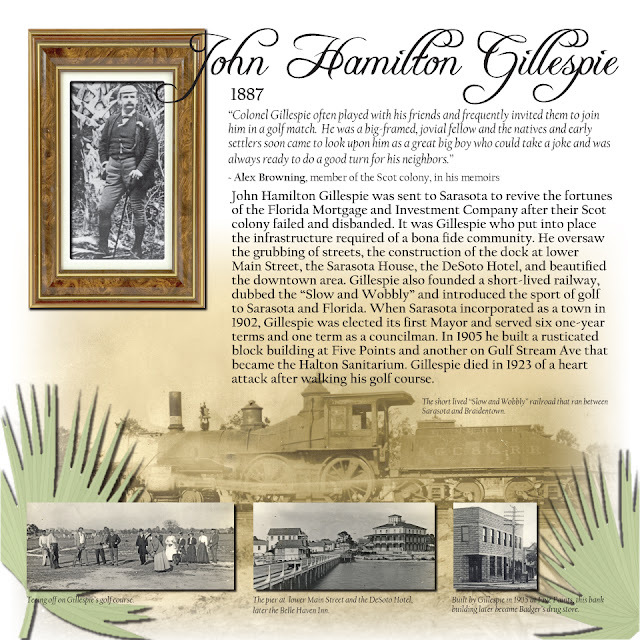 Photos by Sarasota County History Center and Gulf Coast Heritage Association, Inc. Design and Graphics by Laura Dean. Funded in part by a grant from Sun Trust Banks of Florida Foundation. And while you're there be sure to enjoy the 30 acres of gardens and nature trails with stunning views and the area's largest butterfly garden.